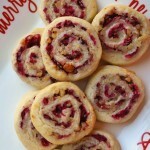 Cranberry Pinwheels are filled with fresh chopped cranberries mixed with chopped walnuts or pecans then rolled like a jelly roll, chilled, sliced into 1/4″ slices and baked to perfection. So pretty for a Cookie Tray! You will want to purchase extra bags of cranberries to freeze so you can have this cookie any time of the year. Cream butter and sugar at medium speed with mixer until light and fluffy. Gradually add flour, baking powder and salt. Cover dough and chill for 1 hour. Process cranberries in food processor to finely chop, remove to medium bowl. Cut roll into 1/4″ thick slices. Place slices on parchment lined or lightly greased baking sheet. Bake on top rack in oven at 375 for 14-15 minutes. Freeze up to 2 months. Be sure to wrap in parchment or wax paper, then foil when freezing. Tip: The finer the cranberries the easier it will be to slice the cookies especially if slightly frozen. Tip: Best results, allow cookies to thaw slightly before cutting and baking. 2004. I purchase several bags of cranberries during Thanksgiving season to freeze so I can bake these cookies anytime of the year. These make a pretty Cookie for the cookie tray or gift to give. While everyone goes shopping the day after Thanksgiving, I like to get in my kitchen and bake several batches of cookies that can be made ahead and frozen. A lot of my cookies are unbaked rolls of cookie dough that I will slice and bake right before I put together cookie trays. I make several cookie trays for family, friends, and my husband Doug’s co-workers. There are certain cookies that always get rave reviews and those are the cookies that I am sharing. Ricotta Lemon Cookies, Poinsettia Cookies, and Cranberry Walnut Cookies. Other Christmas Cookies for trays include, Santa Meringue Hats, Snowmen Oreo Pops, Maple Leaf Cookies, Stained Glass Chocolates, and Kit Kat Christmas Trees. I freeze cookies without decoration then decorate a few at a time when putting together my cookie trays. Be sure to check out how to Assemble a Show Stopping Cookie Tray.